Mahatma Yoga Ashram offers spiritual yoga retreat which has a club with ashram lifestyle as well as abode in Himalaya. The ashram offers one week and two week program and is focused on trekking in Himalayas and exploring some mystical peaks of Himalaya like Gomukh which is always a trekker wonder because of the origin of holy river The Ganges at an altitude of 13,200 feet /4023 meters, and the another trek to the world highest Shiva temple at Tungnath temple covering trekking destination such as Chopta, Chandrashila, Deoriatal Trek and Tungnath at the altitude of 12,083 ft/3683 meter. This Spiritual Yoga Retreat in the Himalayas conducted by Mahatma Yoga ashram gives a unique opportunity to experience both ashram lifestyle in the first week followed by trekking into the deep Himalayas in the second week. 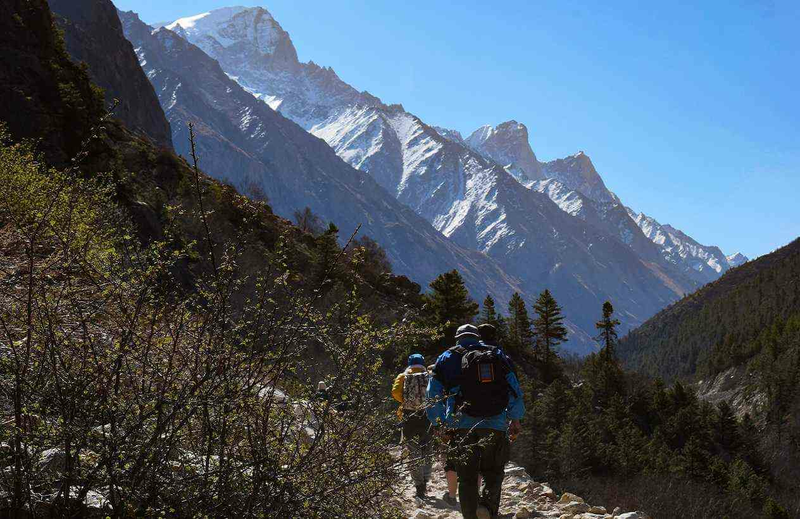 One can also opt to join straightly to the trekking of Himalayas for these two spiritual tours by enrolling for the second week and skipping the first week of yoga retreat or Ayurveda retreat Mahatma Yoga Ashram yoga retreat. Remaining fee needs to be paid upon arrival before starting of the retreat. The first week at Mahatma Yoga will have an ashram lifestyle to experience a yogic life with a practice of light yoga asana, a practice of meditation, pranayama, mantra chanting which will prepare the participants for next week spiritual journey into the deep Himalayas. Mahatma Yoga Ashram is located in the foothills of the Himalayas in the beautiful city Rishikesh where nature can be seen and felt and one can experience the bliss and tranquility at this place and silent presence of those great yogis and sages who have been spent some part of their life for their deeper spiritual connection at this serene place. Mahatma Yoga Ashram in Rishikesh will be your home for the first week of the retreat. During the first week of your retreat, you will be practicing yoga asana, unfolding the various layer of meditation and pranayama, mantra chanting and an introduction with Reiki the science of healing. Our first-week retreat will also have leisure time in between so that one can visit and explore in the afternoon to venture out and visit many beautiful places nearby like Beatles Ashram, meditation caves, and temples in Rishikesh. Our evenings are purely magical, one can enjoy the calm and restorative energy that flows towards you from the Holy Ganges and gain inner peace as you learn meditation. 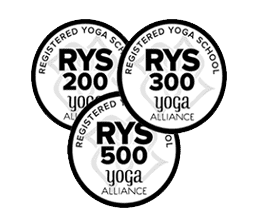 The first week of the Spiritual Yoga Retreat has been planned in such a way that you can unwind and relax, become centered in preparation for the spiritual pilgrimage in the second week of the Spiritual Yoga Retreat in the Himalayas. 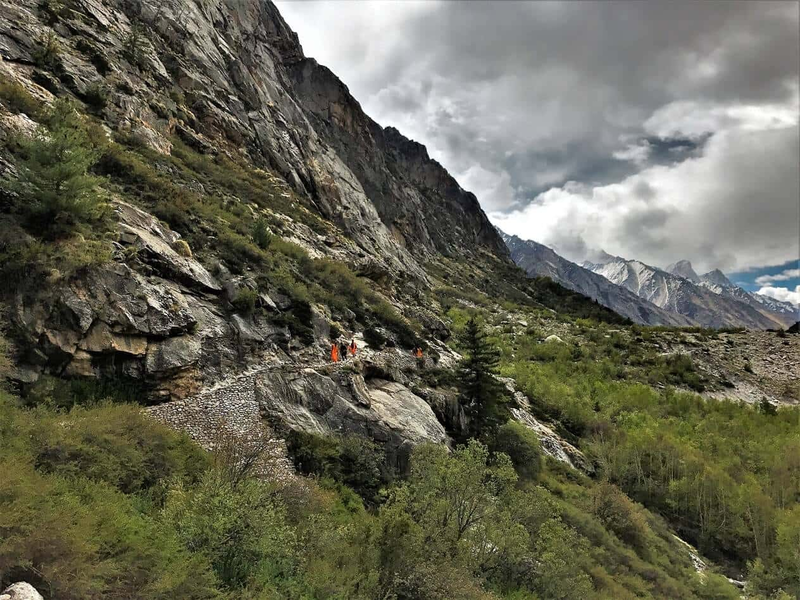 We have chosen two beautiful itineraries for the second week of spiritual journey, one with the trekking to the source of Ganges at Gomukh and another at world’s highest Shiva Temple. The journey will start by a road trip crossing beautiful Himalayan city like Uttarkashi, bath at hot spring water at Gangnani, visit famous Gangotri temple, yogic trek to Gomukh from an altitude starting at Gangotri of 3048 meters to 3890 Meters at Gomukh Glacier. 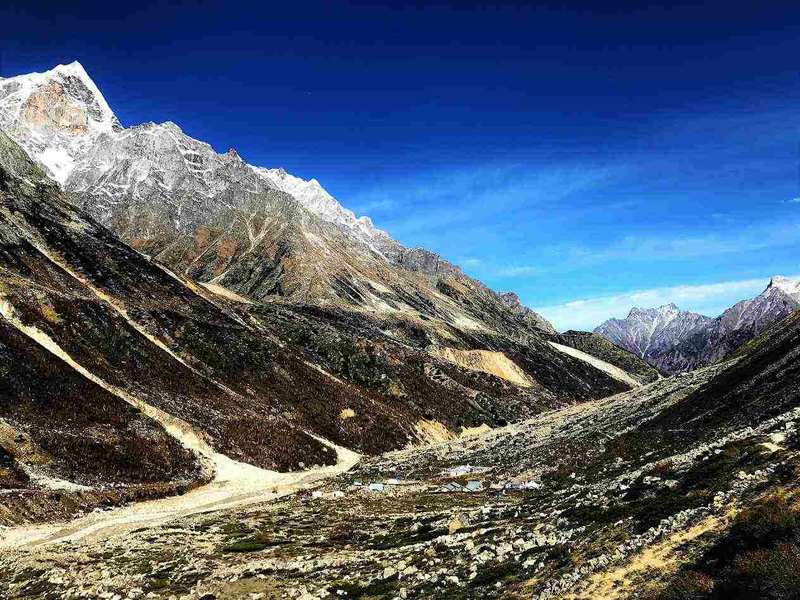 This 18 km trekking one side will acknowledge the cultural immersion from the local rural Himalayan people with the glimpse of beautiful mountain peaks on way and walking on the hills and some time traverse rickety wooden bridges following in the imaginable footsteps of ancient times pilgrims and those Sadhu who choose this wonderland for their supreme spiritual connection. Our second itinerary for the second week is the beautiful destination which is world’s highest Shiva temple at Tungnath. Lord Shiva the Adiyogi or the first yogi has a beautiful temple at an altitude of 3,460 m (11,352 ft), which is believed to be 5000 years old. This one week journey will have beautiful trekking starting from Village Sari starting at an altitude of (7,841 ft/2390 m) crossing Chandrashila peak, Deoriatal the beautiful lake, Chopta forest trekking in the midst of oak, maple and rhododendron trees, followed by a beautiful bird chirping while passing some meadows with old shepherd huts and if lucky the spotting some tracks of wild animals, like foxes and leopards. The ascent to the Tungnath temple and on the top of the Chandrashila peak the unbelievable 360-degrees views of over 7000 mountain peaks on the rising Sun will be the most unforgettable moment you will ever experience on any Himalayan trek. Day 7: Drive from Mahatma Yoga Ashram in Rishikesh to Sari village by private car, 8 Hour drive. Day 8: Sari (6,601 ft/2012 m) to Deoriatal (7,841 ft/2390 m). 1 hour trek, 3 km. Night at the Deoriatal campsite/guesthouse. Day 9: Deoriatal (7,841 ft/2390 m) to Chopta (8,790 ft/2679 m). 7-8 hours trek, 14 km. Night at the Chopta campsite/guesthouse. Day 10: Chopta (8,790 ft/2679 m) to Tungnath and Chandrashila (12,083 ft/3683 m) and back to Chopta. 4 hours trek, 8 km. Night at the Chopta campsite/guesthouse. Day 11: Drive from Chopta to Rishikesh. We’ll reach Rishikesh at Mahatma Yoga ashram around 6 pm -7 pm. Group dinner and night stay in the Ashram. *One can opt to choose Ayurveda Retreat instead of Yoga Retreat in the first week with an additional nominal cost of US$90 which has one daily Ayurvedic massage with Panchakarma treatment. Yogi Ji, the renowned Yoga Master, will travel with you on this spiritual journey. He will give you insights about the most sacred sites as you trek in the Himalayas and will have philosophical discourses for you to reflect on as you sit in the lap of nature looking within. Trekking right up to Gomukh and Tungnath is a powerful and transformative journey. Dipping in the icy waters at this source of the Ganges or trekking to the abode of Adi guru at world highest temple, both this destination is surely the ultimate spiritual experience under the guideline of Yogi Ji.